Every gift up to $25,000 total will be matched if made during the month of April 2019. Don’t miss this chance to make twice the impact for students with learning disabilities today! 21% 21% of $50K goal raised! Click here to Double your Donation! Double your donation’s power by donating in April. 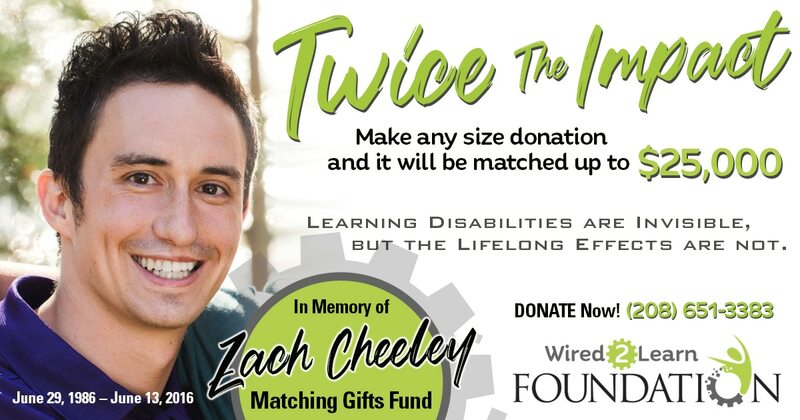 Your donation will be matched in memory of Zach Cheeley up to $25,000 total. Read the original KREM2 Story here. The impact that individualized education will have on a child’s life and future is invaluable! You can make a difference for children with Learning Disabilities right here in our community. Your compassionate gift to the Wired2Learn Foundation will go directly to fund specialized, brain-based education for children in need. Subscribe to learn about opportunities to help kids with learning disabilities through the Wired2Learn Foundation.